In keeping with the comedy week, Biggie has challenged the housemates to a creative combination of comedy and music. For the Wednesday night presentation, Biggie wants the housemates to prepare a musical comedy skit. Biggie said that he wanted the musical comedy skit to take the form of a song or chant centred around a specific theme. He said that each housemate should contribute a verse to the song. Big Brother said that each verse should contain only four lines and that the rhythm of each verse should be the same and the words must rhyme. The theme of the task to be worked on was "Living in Biggie's Crib". 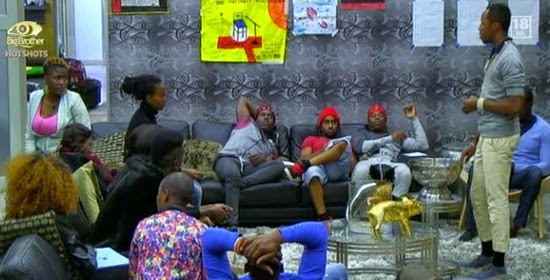 To help the housemates think along the correct lines, Biggie showed the hotshots a reference of a musical comedy skit of the same nature. Housemates soon watched the clip on the TV in the lounge to wrap their heads around what Biggie is looking for. Biggie advised the housemates to watch and listen to the video clip carefully and further told them to be original, creative and funny! Housemates soon began throwing rhymes around, getting silly and having fun whilst at it. It looked like the housemates would come up with something entertaining! JJ and Trezagah went the old school way, grabbing paper and pen and jotting down their lines. It will be interesting to see what the hotshots come up with. Who do you think we come up with the funniest rhymes?